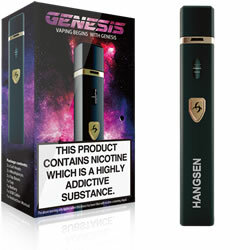 HS GENESIS - BLACK KIT buy from NUCIG UK. The HS Genesis by HANGSEN is the all-in-one vape pen where the tank and battery unit comprises of one single cylinder, giving it a simple classy look. The device boasts a magnesium alloy casing and offers the average vaper a full day of vaping, while the built-in tank is fully TPD compliant and 100% leak free. The Genesis is equipped with Hangsen's latest temperature sensing chip intended to detect any heat surges to coil, ensuring that dry hits are all but eliminated. The device includes a magnetic dust cap to prevent dust, dirt, and other debris from getting into the mouth-piece. The Genesis has a generous built-in 1500mAh battery with the 0.4 ohm coil for a fuller flavour vape and satisfying volume vapour production. This Genesis also comes with a micro USB charger. The tank has a 1.5ml capacity, powered by replaceable heating head coils. Wonderful creation and so clean. No messy changing tops and coils just out it pops and fill it up - to the line of course. Was so impressed have purchased another one. Just love the magnetic cap over the mouth piece, great for me having animals in the house, no more mouthfuls of kitty hair. Will be getting rid of my old ecigs which I have been using for years and gradually buying more of these Genesis. Not smoked a cigarette for 6 years now thanks to Nucigs lovely BH eliquid and zero BH eliquid which I use 50/50. You have made me so happy in that I don't smoke cigarettes anymore, after 40 years of smoking it was time as I had a bad lung xray which showed a mass which I have no more!!!!!! Also it is cheaper which is also a bonus. Thank you Nucig! Simple, easy to use and perfect as a starter kit. Small, slim and fits perfect in th epocket or bag. I like the snap on/off magnetic cover for the tip which keeps dust out when not in use. Lets out plenty of smoke and easy to refill.